Today I am delighted to bring you an interview with Kristin Cashore, the multiple award-winning and Starred-review author of Graceling (2008) and Fire (2009). I think there are few contemporary authors who have enjoyed such immediate success as Ms Cashore with her debut novel, Graceling, setting a benchmark for YA fantasy adventure with a strong, independent young heroine—but with plenty of romance in the mix as well. Helen: Bitterblue is your third novel and returns to the world of Graceling and Fire, but in particular to the kingdom of Monsea—ruled by the tyrant Leck in Graceling—where it picks up the story of Leck’s daughter, Bitterblue. What led you to want to tell her story as your “next book”? Kristin: It’s impossible to predict where a book idea is going to come from. This one happened differently from any other book I’ve ever written or tried to write; it was like a bolt of lightning, and consequently, I remember exactly where I was. I was standing in the sun, on the balcony over the courtyard in the main branch of the Jacksonville Public Library in Jacksonville, Florida, having a casual phone conversation with my mother. I told her I wasn’t sure what I was going to write once I was done with Fire. She said to me something along the lines of, “You know who’s interesting, Kristin? Bitterblue.” When she said the word, it was like a puzzle piece falling into place – in a puzzle I hadn’t even realized I was building! In that moment, I didn’t know what the story was going to be, but I knew, with conviction, that it would be Bitterblue’s story. It was kind of weird, to be honest. Then, as I began to plan the book and realize what the plot needed to be, my mental understanding caught up with my emotional understanding. The story became clear to me; Bitterblue’s need to deal with her past became apparent. Maybe she’d been asking me to help her tell her story all along, but I didn’t hear her until the moment my mother spoke her name. Helen: Bitterblue is also strongly focused around consequences arising from Monsea’s past under Leck, both for individual people and the society as a whole. Did you set out to explore consequences in this way, or did the focus evolve through the act of telling Bitterblue’s story? Kristin: I knew from the start that this book would be not just about Bitterblue, but about Leck. I knew it would be about the broken people all around Bitterblue, and Bitterblue’s struggle to figure out how to bring her kingdom into the light. It couldn’t realistically have been about anything else. 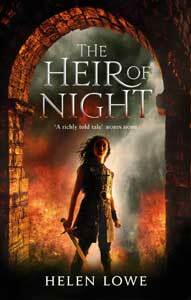 The young queen of a kingdom that’s endured what the Monseans have endured would realistically be faced with Bitterblue’s situation, and a young woman who’s experienced the trauma Bitterblue has experienced would need to face it in order to heal. That being said, it wasn’t until I was well into the story that I realized just how much darkness Bitterblue was going to have to face. Helen: As a reader, I have to say that the story direction felt utterly right: the sense of consequences playing out gave the book an integrity that really drew me in. Another distinguishing aspect of this book is that although both Graceling and Fire are centered on heroines with superpowers, Bitterblue has none. Do you see this as departing from current trends in YA Fantasy? Kristin: I’m a bit embarrassed to admit that I’m not up on current trends in YA Fantasy. I tend not to read it while I’m writing it, because reading fantasy while writing fantasy can create a kind of interference – it can become difficult to keep a fresh mind. And I’ve been writing fantasy nonstop for years! I could talk a lot about the mystery genre if you asked, because I’ve been reading plenty of those. :) But I don’t know what’s hot in YA Fantasy. I will say that writing about a “non-magical” protagonist was definitely different from writing about a protagonist with superpowers. I could relate to Bitterblue more than I ever did to Katsa or Fire. Her vulnerabilities felt more familiar to me. Honestly, by the time I was done, she felt like my daughter. That never happened with Katsa or Fire. It was an absolute pleasure to write about a “regular” person. Helen: So what do you, as the author, love most about Bitterblue’s character? Kristin: I love her loneliness. I love her loyalty. I love how much she loves her friends. I love how hard she tries, and I love her refusal to give up. Helen: Yes, that is definitely the Bitterblue I met, but I was also impressed by her generosity, as well as her “fidelity”: the way she strives to keeps faith with her subjects, and the truth of the past, and those she loves, even those who cause her more than a little trouble – not just “cool friends” like Katsa and Po. But speaking of Katsa and Po, a strong romance is central to both Graceling (Katsa and Po) and Fire (Fire and Brigan), but although there is romantic attraction, it does not feel either so central or so strong in Bitterblue. Why is that? Kristin: Bitterblue is a different character, with a different story. From my outside perspective as a writer, I’m not interested in writing the same story over and over; but more importantly, once inside a story, I’m committed to writing what feels like the true story. Bitterblue falls in love for the first time, and that’s an important experience for her. But she has a whole lot more going on than Katsa or Fire ever did. She’s defining herself in terms of her relationships with the people she already loves, her relationship with the past and future, and perhaps most vitally, her relationship with her kingdom. She’s the same age Katsa and Fire were, but she seems younger to me in some ways. And I do think it’s relevant that romance is more complicated for a queen. Let’s give her time. Helen: “Hear hear” to not replicating the same story over and over! Another aspect of Bitterblue that really intrigued me though, was the part codes and code breaking play in the story. Is this something you’ve always been interested in, or did you have to do a lot of research for the book—or both? Kristin: This question gets to one of the funniest things about being a fiction writer. I enjoy the idea of ciphers as a construct in a book, but I’m not particularly interested in solving ciphers myself. I don’t particularly enjoy the mental challenge of them, nor do I always understand them; often, if they show up in a book I’m reading, I feel a bit bored and skip them. But when I’m writing a book, my protagonists have interests, and I need to learn about those interests even if they don’t interest me. I need to become good at things that my characters are good at (or at least, get some help, so that I can fake being good!). Bitterblue is better at mental arithmetic than I am, for example, and she’s worlds better at ciphering than I am. I did a lot of research into ciphers for this book, and it was enjoyable – I had fun choosing what kinds of ciphers I wanted to use where, and I very much enjoyed playing with them as a plot device. I also got help from a few people – linguist Dr. Lance Nathan, my sister Dorothy Cashore, and my mother – and working with all of these people was a delight. But the actual ciphering was a headache! Helen: May I compliment you on your research then, because I found the codes aspect of the book both fun and convincing. You’re obviously close to both your mother and sister: are they your key “early feedback” people for the book or do you have others? Helen: Kristin, thank you very much for agreeing to be interviewed for “…on Anything, Really.” As I said in the introduction, I loved Bitterblue — in fact it may just be my favourite Kristin Cashore novel yet! — and I have very much enjoyed working with you to bring the interview together. Kristin: Helen, thank you so much for these truly wonderful questions! It was a pleasure. Helen: Thank you, Kristin and Emma! 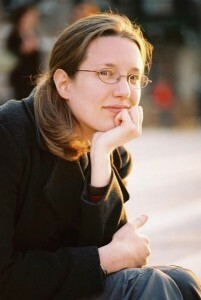 Kristin Cashore wrote the New York Times bestsellers Graceling and Fire, both of which have been named ALA Best Books for Young Adults. Graceling is the winner of the 2009 Mythopoeic Fantasy Award for Children’s Literature and Fire is the winner of Amelia Elizabeth Walden Award. The books are world travelers, currently scheduled to be published in thirty languages. 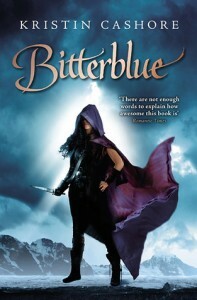 Her third book, Bitterblue, has just been released internationally. I’ve seen the books in the shop. Such eye-catching covers. June, from what I know of what you like, I think you would/will definitely enjoy them. I just finished reading Graceling today. It is a good mixture of fantasy, action and romance. It is a good YA read, and crosses-over to adult readers quite well. Something that I continue to be curious about is the role of class in Kristin’s books. She’s discussed the roles that about sexuality/sexual identity, ability, and race play in her books. But class and class divides was a pretty clear theme in Graceling, even as she has yet to have a protagonist who isn’t part of the aristocracy. Kristin seems like such a deliberate/reflective writer when it comes to identity, and I’m so curious to know (a) why all of her characters are related to monarchs–is it just a fantasy trope or a deliberate action? and (b) what her plans are with future characters. Emma, I’m glad you enjoyed the interview; thank you for your thoughtful comment and questions, which I will draw to Kristin’s attention. How wonderful that you passed that along! I so much appreciated reading her response. Thanks, Helen! I loved the books! Will there be a fourth one? I feel as though I need to see a fourth book. For me, the Graceling series were like the Harry Potter series. The ensnared me, and I wish that I could disappear into that world. I really hope that she writes a fourth book!!! Kristin has created a wonderful world and some ‘magic’ characters—I can well understand readers wanting more of the goodness.